This may have been the first we heard from Katelyn Tuohy (North Rockland, NY), but it surely won't be the last. Heading into today's action in the Girls Distance Medley Relay, the North Rockland girls (Red Raider TC) were seeking their fourth straight national title in the event. The task? Stay in contact until Tuohy gets the baton. They did just that, giving the junior phenom the baton just five seconds off the leader. And Tuohy handled the rest. 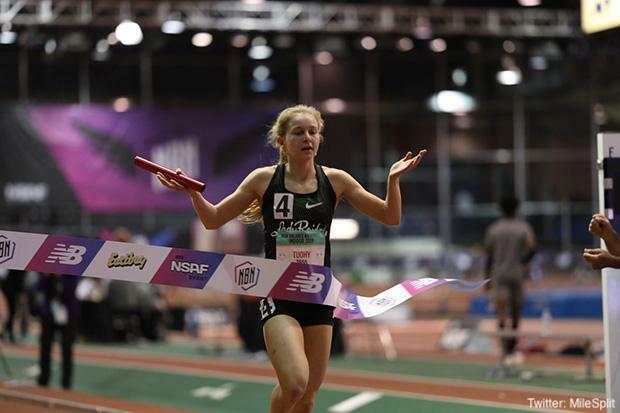 It may have felt like a walk in the park for the 4:33 miler, but her 4:41.9 split was good enough to secure the fourth straight national title in 11:41.84, seven seconds off their meet record of 11:34.85 set in 2016 and seven seconds and change off the national record, 11:34.54 set in 2017 by Lake Braddock. Coming across in second was Stotan Racing TC (Fayetteville-Manlius, NY). Bill Aris's squad crossed the line in 11:45.29 with junior Claire Walters splitting a huge lifetime best 4:51.2 on the anchor leg. In the boys race, it was all Loudoun Valley (VA). The two-time cross country national champions, once again, showed their distance running depth en route to a national record 9:54.41. While the win itself may not come as a shock, the bigger story is that Loudoun's anchor -- Sam Affolder -- split 4:06.2 to break his own record set with his old team: Carlisle (PA). He didn't even have to split 4:06.2 for the win, though. His teammates - Jacob Hunter, Akere Simms, and Connor Wells -- all put him in position to be able to run as slow (or as fast) as 4:14 to secure the win. The record, though, came with Affolder's massive mile time. 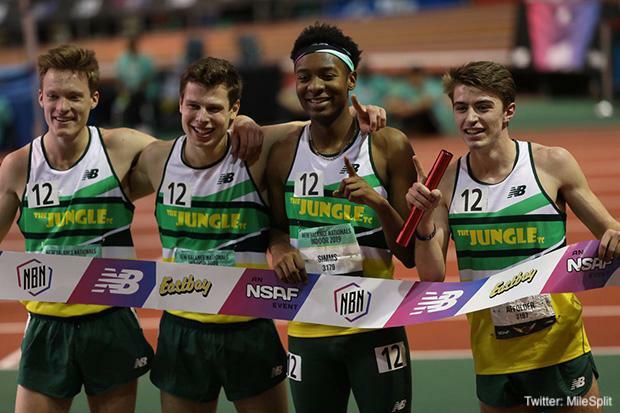 Loudoun Valley will be back to defend their title in the 4xMile on Saturday and enter as heavy favorites for the win. Their 17:17.31 at this year's VA Showcase -- a 4:19.25 average -- is 16 seconds off of their national record from last year, but still within striking distance.